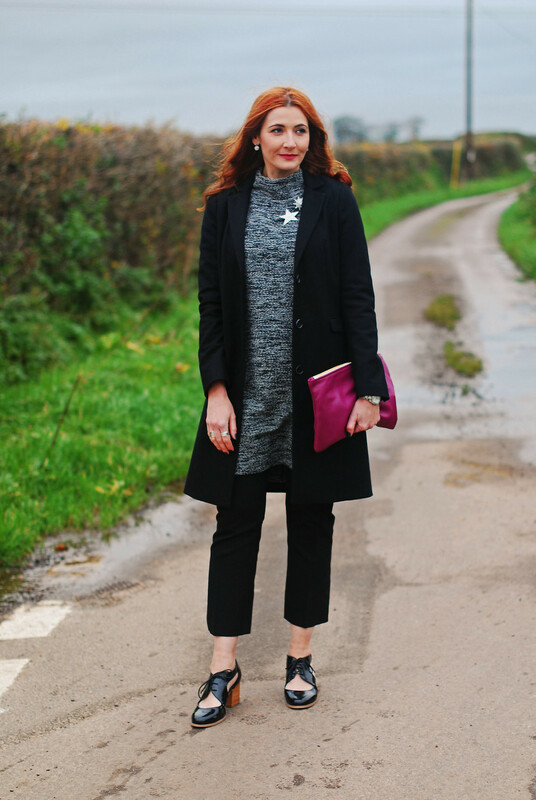 Today I thought I’d show you ways to style not one of my FAVOURITE items of clothing, but one of my LEAST FAVOURITE items: the basic black coat. However, I do love MY black coat. Let’s just say that of black coats in general, I’m not much of a fan, shall we…? I love a well-styled outfit as much as the next woman, but black coats do tend to fill me with dread. Have you ever noticed that in the winter you see a mass of black coats when you’re out and about? Go to a busy train station and you’ll see what I mean… I honestly think that around 80% of people wear a black coat (often a puffa). It’s ever-so-slightly depressing, especially when they’re paired with jeans and black shoes. Or black boots. And a black scarf. Oops, nodded off there whilst pondering black coats…! Now, that’s not to say I’m going to toss mine out (even though I’m such a lover of colour and The Owner Of All the Coloured Coats In The Universe). In fact I actually MADE A POINT of getting a classic black winter coat a few years ago because it was one item I didn’t have in my wardrobe. Disclosure: This post contains affiliate links which means if you click through and buy I may receive a small commission at no cost to you (click here for my full disclosure). Items listed as c/o or * were gifted within the last 12 months. Pretty boring, you might say. HOWEVER, with this coat it was all about the cut and the tailoring (the nearest one I could find to mine is this classic black coat from Hobbs). Longline and in wool, single-breasted, plain lapels, slightly nipped in at the waist. Perfect. 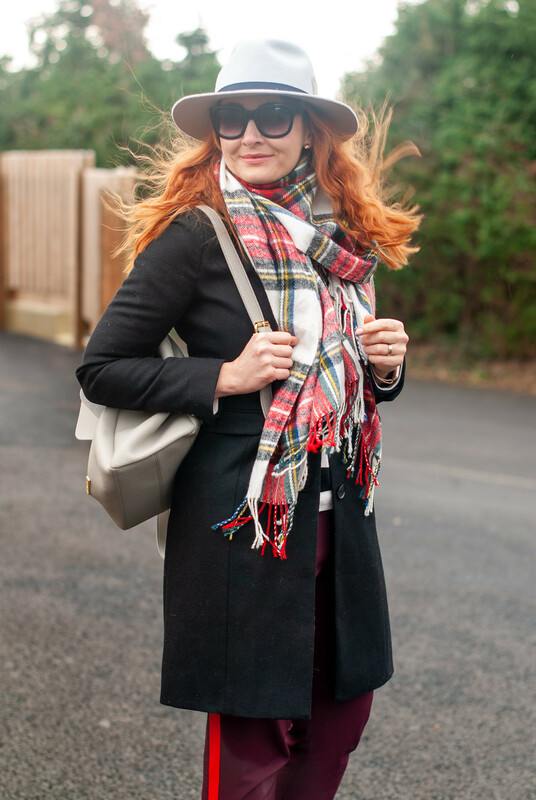 I’ve worn my black coat about five times on the blog (that I could remember), but every time I’ve followed my own advice and added plenty of colour and texture. This time? 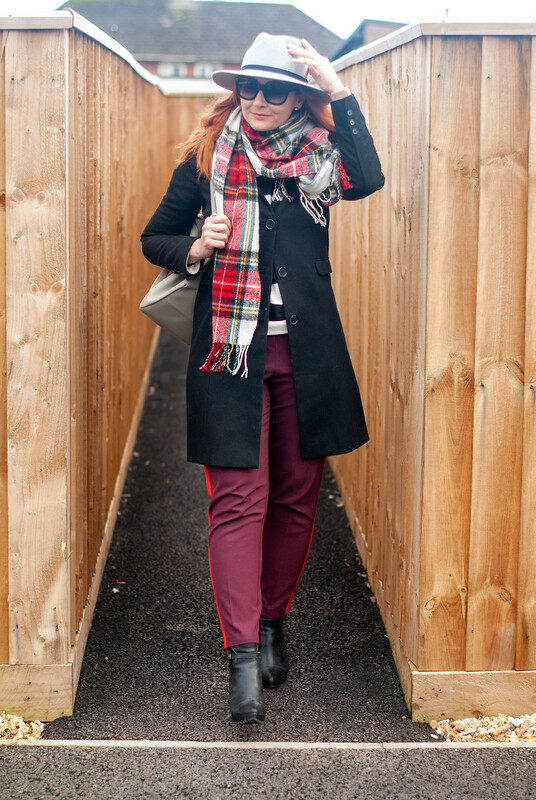 I went with a smart casual look: a white-background tartan scarf, burgundy trousers with a red go-faster-stripe (love these), chunky heeled ankle boots (similar) and a black and white (wide) stripe sweater. The accessories I chose were a grey wool fedora* and a smart grey leather backpack*. I’m pretty much only wearing black, white and red but there’s a lot going on here in the way of pattern and texture, so no worries about blending into those crowds. 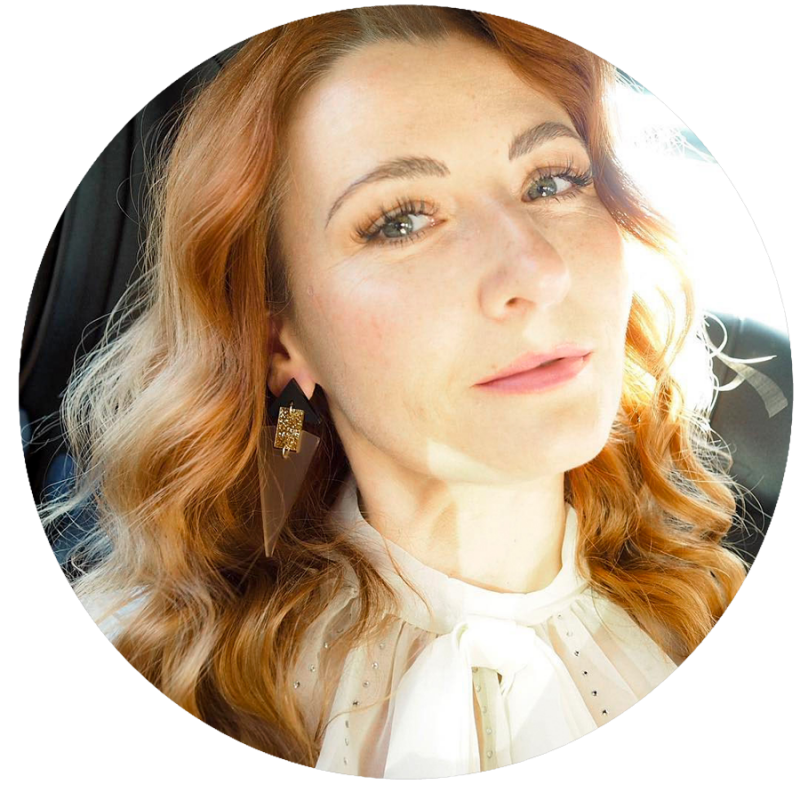 Scroll down to see the other ways I’ve styled my black coat, all the while avoiding that winter uniform of the masses. I’ve included a couple of dressy looks (good for date nights in winter), another smart casual look and then one with jeans. Even I break my own self-enforced “rules” at times…! One thing that’s an essential with black coats, though: always have a lint roller on hand. A black coat always picks up the MINUTEST bits of fluff and hairs and makes them look 10 times worse than they would on any other colour. I rollered my coat literally just before walking out the door to take photos, and STILL you can see fluffy bits. Aaaaargh to all that mysterious white fluff and [dog] hair! 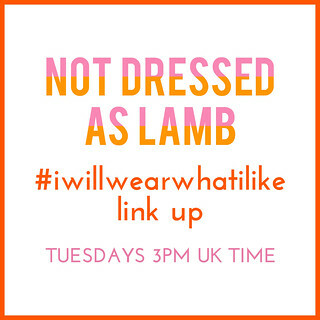 Do add your outfits to this week’s link up – and if you’ve added a link to here or my button to your post you may be featured in my monthly Women Who Wear What They Like post. 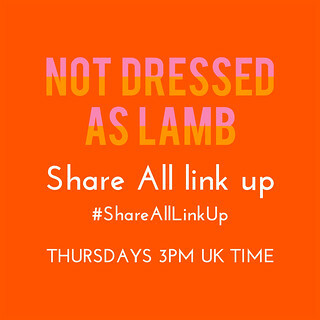 The link up goes live every Tuesday at around 3pm UK time and will stay open for a week. Whilst the original article was of course aimed at the 30+, you can be ANY age to link up. The only criteria is that you’re wearing whatever you damn well like! Ok, you’ve put a whole lot of punch into the all black coat! Even though I grab my black coat more frequently than I’d like to admit (ahm, everyday), I have so much more kick in my step when I grab my red or animal print one! The black is just so easy. So yes, if you must grab the black coat, good to have some fun accessories near by on in the car to throw on! I must say though, my favorite accessory here is your gorgeous hair! Just stunning ! 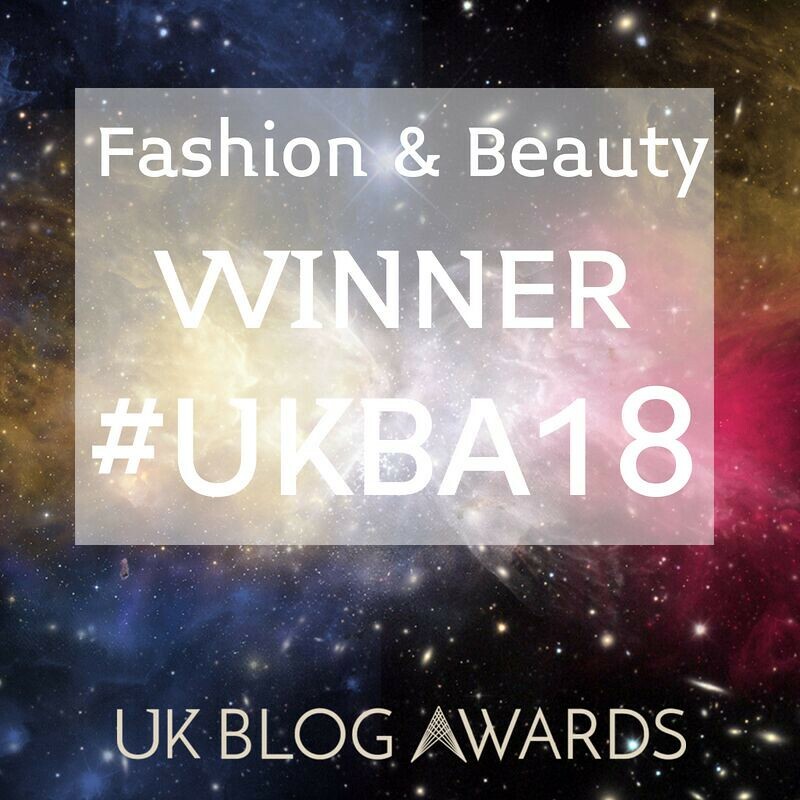 Aww that’s lovely of you – thanks Suzanne! I always wear colour with black, unless I’m deliberately going for a dramatic look, because it can look rather bleak. 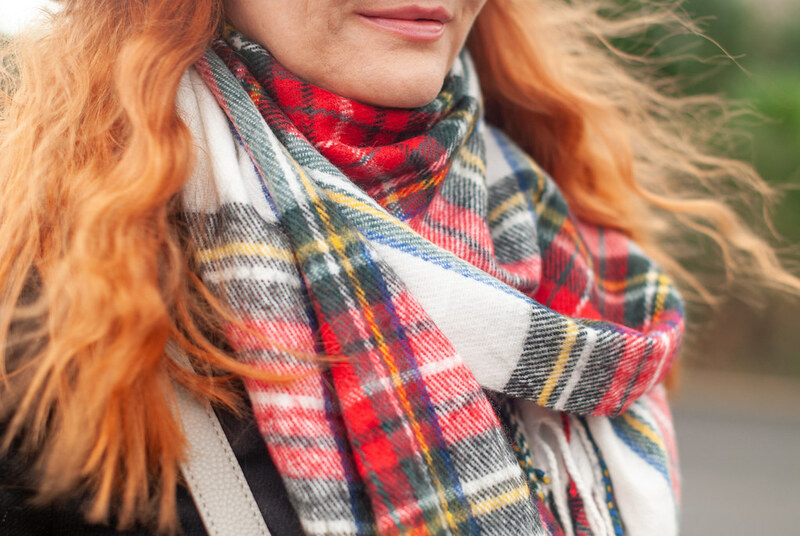 I’ve got a couple of tartan blanket scarves that are great for keeping warm in the winter, and they go with almost anything. I love the fedora and the side stripe trousers! Well it may not be your favorite, but you do wear it well. They are a great blank canvas for building on and you’ve accomplished that. YAY! I actually don’t own a basic black coat although I do have two basics in navy and gray. I own the all of the colorful coats in the world that you don’t …lol! It is funny that you dread black coats as do I. I have one long black wool coat with a furry hod that is 20 years old. And it does end up being my go-to when none of my many patterned coats seem to match my outfit. I also have been in need of a neutral mid length coat and have been wanting a black one, but I do find them all so boring and still have not added the right one to my wardrobe. Maybe I need to consider a camel one…that is not a color I have in my coat wardrobe. IN any event, I do love all your stylings of a boring black coat. You are far cry from boring, my friend! I love black, but I totally agree that too much of it is so very depressing to see! Your Katherine Hepburn outfit is so perfect in every way I almost don’t notice the coat. It just provides some context for the black bow. That really is one of my faves on you ever. All your looks so beautifully how a black coat need not be boring, just a matter of adding some colour. Unfortunately this is not the norm , especially with the dreaded puffa jackets or coats. Many thanks for hosting Catherine. I hear what your saying about the black coat, but I think it can serve as a great backdrop to an outfit though, especially something with a lot of color in it. I love yours paired with the plaid scarf. Thanks for the link up. The trousers and neck tie outfit is one of my all time faves of yours. I agree that wearing a black coat can often be an afterthought to people, rather than planned and co-ordinate like other colours. It deserves more, a black coat can be very chic! 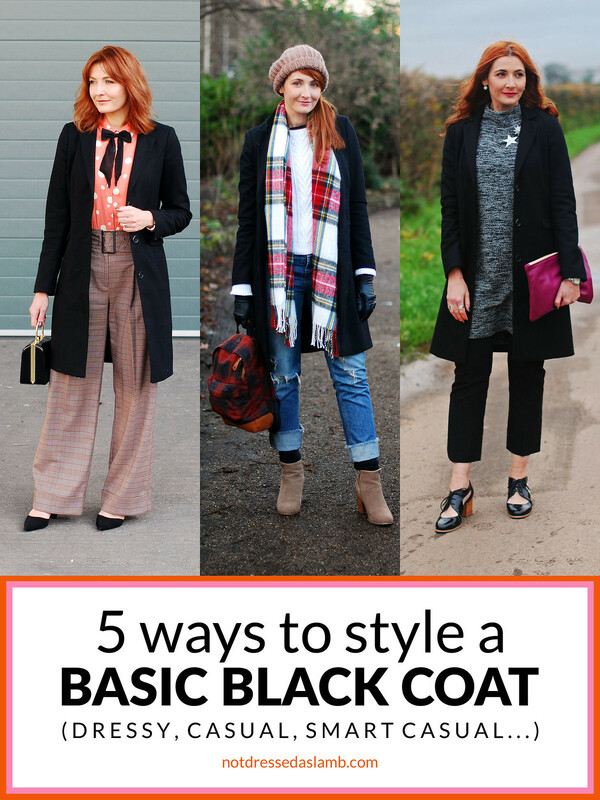 Basic black coats can be…basic, but as you’ve proven, also a great canvas for all manner of styling. I have a few black coats and feel like they’re a good way to ground any craziness of whatever else I’m wearing! I actually love black! But I wear colours more and more. It’s a very beautiful coat you are wearing! Have a great evening! I love those burgundy pants with the orange stripe, Catherine. Especially with the black coat and boots. I’m not a fan of black winter coats, either, since they are usually wool and pick up EVERYTHING! Hope you don’t mind if my “outfit” post this week is tongue in cheek, kind of. There’s been a bit of a flurry on Twitter over here on how unchic it is to wear ski or snow pants in -25°C weather. Ha. And I couldn’t help wading in. Aww thanks Laurie – as you know I usually steer clear of black too…! You are just like me. I don’t love them because I feel like part of the masses in mine. That’s why I don’t even have a solid black one right now. Although when I did, I ended up layering it with another coat, just to make it more fun. That is one of the things I love about you, Catherine….your love of color and pizzazz!! I noticed last week how everyone in London seemed to be wearing a black or navy coat and it looked like a scene from some dystopian state! 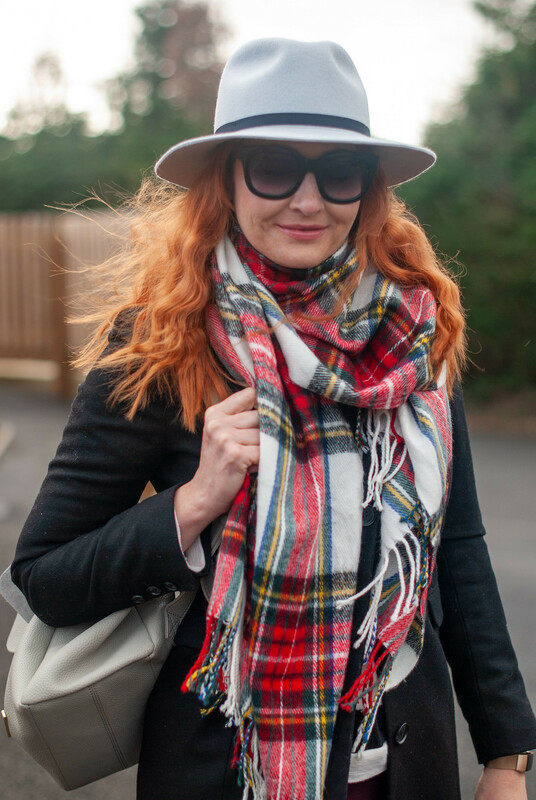 Hurrah for livening up your black coat with that gorgeous scarf and hat! I was right about that, wasn’t I Gail?!! I can actually remember the times I’ve seen someone wearing something bright and fabulous in winter it’s so infrequent…!